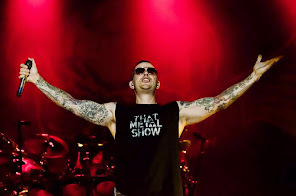 Avenged Sevenfold News: Arin Ilejay: "I had never played classic metal or hard rock before. In my head..."
Arin Ilejay: "I had never played classic metal or hard rock before. In my head..."
Hail to the King, the first full disk with your contribution as drummer, turned to the metal and classic rock. How have you approached this change? I do not know how it was for others, but I did my best to play the disc and create the right styles. It was a novelty for me. I had never played [more classic metal or hard rock] before. In my head, I would have come up with a crazy drum solo for each song to impress everyone. But others said, "No, we will put our mark on classic rock." So I set myself my color. We now form a whole. We all work to what Avenged Sevenfold.